I love these cookies. I just had to pin them. A belated Happy Mother's Day. Sorry for all the rain/bad weather. If I had my way I would take all the excess rain. We are having such a drought here in CA. Hi Kitty. Back so I can comment! I LOVE your teacup..so pretty! And who deosn't love oatmeal raisin...one of my favorites too! Thanks for linking to Tuesday Cuppa Tea! I had to smile when I saw your oatmeal cookies....you see, my grandpa Don LOVES oatmeal cookies as you know he is having surgery tomorrow so he has been on my mind a lot lately :) I will have to make these for him when he gets back home. Have a beautiful Monday, my friend. Love to you! Your cookies sound delicious. Oatmeal raisin is such a great combination. Sweet teacup from your mom. Hope your week is full of joy, Kitty. Love everything...from the delicious cookie, to the adorable green plate, the pretty tulip, the teacup...everything! This is my hubby's favorite cookie and I WILL be making it for him soon...printing! Thanks for sharing with us at Weekend Potluck too. Cookies and tea, you always create perfect tablescapes. Also your comment to me are alway so sweet and enjoyable to recieve. Glad it is dry today, more rain coming God is filling our lakes with needed water. Your top picture is very pretty. I like your Royal Albert teacup and glad you were still able to enjoy Mother's day. Very nice teacup and I love the polkadot plate with white trim! Now I must confess that I'm more of a chocolate chip cookie gal, but I'd be willing to sample your oatmeal raisin cookies! Love oatmeal cookies! Do you ever add pecans? I always add them too. :) Your tea cup and saucer are beautiful! I love polka dots too. It really was a miserable day yesterday wasn't it? Hope everything went well for you. Mmm, your favourite cookie looks wonderful, Kitty. Your setting is so fresh and pretty too. Cookies and tea, can't beat that treat! Thank you for joining me for tea and enjoy this new week, sweet friend. Nicely colour coordinated with your china and I like the adorable bear joining you for tea this week. I think some of the cinnamon chips might be nice in your cookie recipe Kitty. What a pretty scene...the tulips are so colorful. Rabbits ate every single one of my red ones...never touched the yellow though. I'd love to get some in that color of yours. Thanks for the recipe for the cookies. Everything you make is always sooo tempting, Kitty. YUM! Pretty teacup! I love Oatmeal Raisin cookies. Now you got me wanting to make some! Thank you, dearest friend, for sharing with Roses of Inspiration :) Love to you! I thought that cup and saucer looked very familiar and now I remember why. I have one just like it in my shop right now - of course it is hand painted and lovely. Your recipe is really nice and wouldn't these be good in a brown bag lunch for kids. Healthy too! Happy Belated Mother's Day to you!! It sounds like you had a nice one. It rained here too, but later in the day the sun came out. :) I LOVE your beautiful Royal Albert teacup and saucer and all your polka dots, too. I'm definitely a polka dot kinda girl. :-D The stuffed rabbit is so pretty -- it reminds me of the Bearington rabbits I have. Thanks for sharing your cookie recipe -- it looks delish! We have a favorite family oatmeal chocolate chip cookie recipe that I plan to share on the blog one day. I like to use a scooper for mine too. I hope you're having nice weather there and have a great day, my friend! Your favorite cookie? I'm taking notice! Hi Kitty, your recipe looks just yummy. I like that it has dark and golden raisins. I love golden raisins. Oatmeal cookies are my husband's favorite. I just love how you said that 'polka dots make everyone happy'...oh, so true! 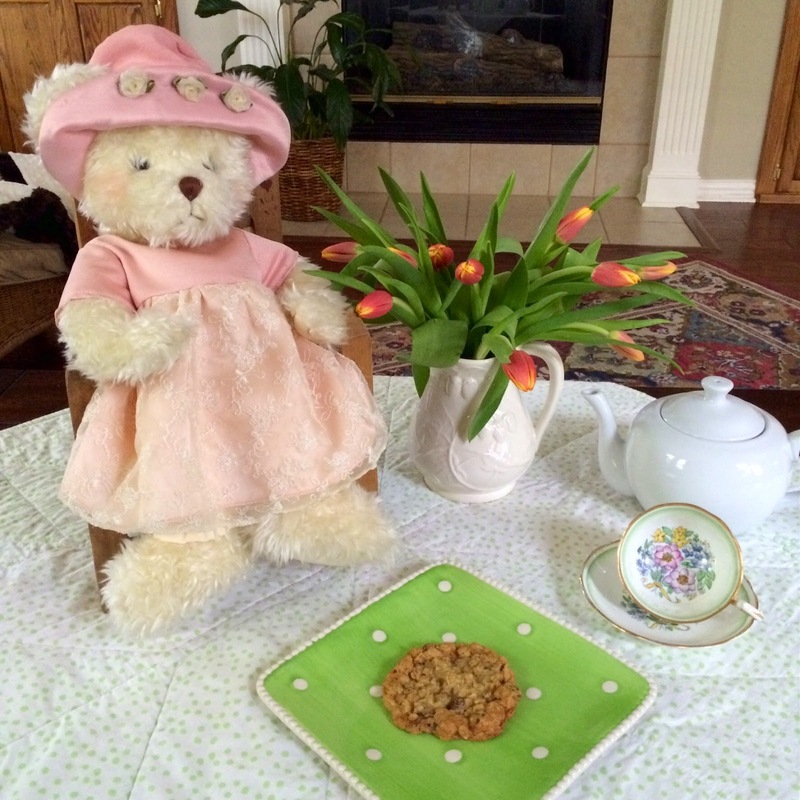 Your tea set is so elegant, Kitty and your raisin cookies look too delicious for words! Have a very blessed weekend and lots of love! Adorable! And I will be trying the recipe - Love the tip about freezing them. Great idea. Thanks for the tip about freezing the cookie dough Kitty. I just made my son his favorite, oatmeal scotchies, and noticed they spread a little too much, so I will have to try this. What a pretty tea cup! Yummy recipe. One of my most fave cookies. Hope you had a wonderful Mother's Day. I do love a good oatmeal raisin cookie Kitty! I'll have to try that freezer idea. Thanks for sharing with SYC. Kitty, that is my favorite kind of oatmeal cookie -- no chocolate chips, just raisins! I do the freezing the dough balls thing, too. Isn't it just the best thing when someone says I wish I had some oatmeal cookies right now and you can say you'll have them ready in no time?! First let me tell you how good that Oatmeal Raisin Cookie looks, sure wish I had it right now with my coffee. Do you ever remember having this much rain all at one time, my goodness. We came home from attending a Granddaughter's Graduation in Oklahoma on Saturday, in between tornado's, I was never so grateful to get home. Stay safe and dry! Hope you are having a great day and thanks so much for sharing with Full Plate Thursday this week.